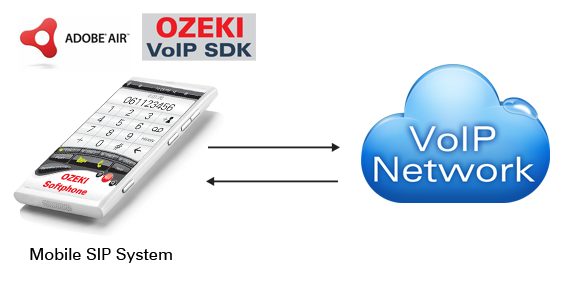 Ozeki VoIP SIP SDK provides professional technology to integrate VoIP solutions into mobile platforms. This article is a brief introduction about connecting mobile devices to a VoIP network using Ozeki VoIP SIP SDK. After reading through this page you will be fully familiar with all the essential terms concerning mobile devices on VoIP networks and what you will need for creating your own solution using Ozeki SIP SDK. Mobile devices become more and more popular nowadays and they went through so great improvement that they can be used as handheld computer systems. This improvement ensures that the voice over IP model has the possibility to spread on these devices too. Any mobile device, cell phone, tablet PC, iPad, etc. can be connected to the VoIP network as they are usually using wireless Internet connection and mobile net. These devices are basically made for communication purposes but the mobile communication can be expansive and VoIP communication can provide more possibilities for the users anyway. The mobile devices usually use special operating systems that were designed for mobile purposes and therefore most of them use special development toolkits and running environments. The most wide spread devices use Mac solutions, like iPhone or iPad, Android, like a lot of smart phones and tablets or Windows Phone that is a dedicated mobile operating system of Microsoft. In some cases the mobile applications can use similar solutions than the ordinary VoIP applications, but they might be different on some devices. Ozeki VoIP SIP SDK provides the tools for creating VoIP solution capable for communication on mobile devices too. The possibilities are endless. There are a lot of mobile device types on the market and most of them have their own special programming tools. If you do not want to create separate programs in separate languages, you can choose the possibility of having the same program on more devices. This will not cover the whole market but a great part of it. The tool, you can use is Ozeki VoIP SIP SDK and Adobe Flash technology that can be exported to Android and Apple mobile devices, therefore you need to write the code once and you can use it on many devices. Adobe Air mobile technology is an easy-to-use tool that you can use with the Ozeki VoIP SIP SDK to develop mobile applications and more. As Adobe Air is basically a desktop environment, you can also create desktop applications with the same Flash code that you used in Flash webphones, and mobile applications.